Spring 2015: A new book and new events! This spring brings me a new novel and several speaking engagements. I hope you can join me! 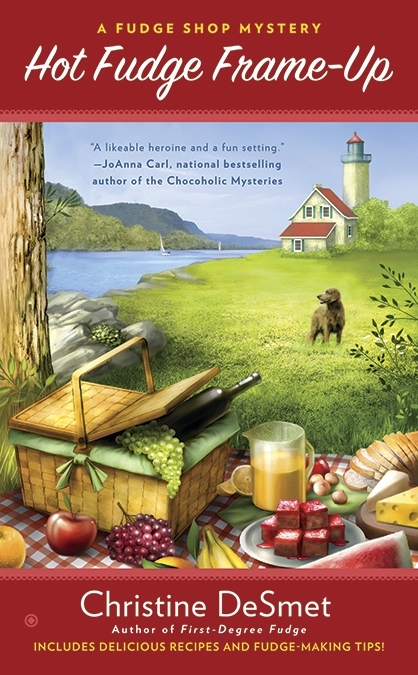 The national-bestselling series continues with Ava and Grandpa Gil in the chocolate crosshairs of a deadly arsonist spoiling a visit by Belgium’s fudge-loving royal family to Door County, Wis. and the village of Namur, where a famous divinity fudge recipe may have been hidden back in the 1800s. Will the maker of Cinderella Pink Fairy Tale Fudge get her prince finally? 1863 Monroe St., Madison, Wis.
Free panel discussion; several authors. Public Library, 107 S. Main St., Waupaca, Wis.
Look for giveaways at many: April 3, Lori’s Reading Corner; April 7, A Cozy Girl Reads; April 13, Fresh Fiction; April 15, Escape with Dollycas Into A Book; April 17, Books-N-Kisses Review; April 23, Marie’s Cozy Corner. 11 classes, open to beginners/advanced. Poetry, fiction, nonfiction, memoir, personal essays. 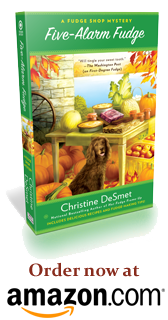 Christine DeSmet’s Master Class is currently full, but check out two other Master Classes for full novels and your first 50 pages. Held at Pyle Center, 702 Langdon St. This is book 2 of the Fudge Shop Mystery Series featuring Ava Oosterling and her Grandpa Gil who run a bait and fudge shop on the shore of Lake Michigan. Check out the Fudge Shop Mystery Series page for synoposis.